I comment briefly here about some claims regarding ‘clicks’, the consonants technically described as ‘velaric ingressives’ (produced with airstreams drawn INTO the mouth and by movement of the velum aka the soft palate rather than by the lungs). These consonants are especially associated with the Khoisan or ‘Bushman’ languages of Namibia and neighbouring areas of southern Africa, as famously portrayed in the movie The Gods Must Be Crazy. Some of them resemble the sound stereotypically used to ‘gee up’ horses. The mainstream palaeoanthropologist (etc.) Alice Roberts comments upon the long early period when pre-literate humans probably already had language (for the details of which little concrete evidence survives, naturally); she includes an interesting discussion of ‘click’ consonants in a range of African languages, comparing their distribution with genetic data and suggesting (with others, and not unpersuasively) that the development of these phones may well have pre-dated sapiens expansion from Africa. There are also some more specific, less mainstream (and less persuasively argued) book-length works along broadly similar lines, such as that of Roman Stopa on alleged links between Indo-European and Khoisan. A manifestly non-mainstream article by T. Kluge argues that the human capacity for speech results from features of the brain, notably the ‘language centre’, which have become strengthened through the use of the arms, which in turn arose from the overall arrangement of human limbs (two arms, no wings). Kluge also associates many phonetic features with physiological characteristics; he claims, for instance, that clicks are associated with certain ‘racially’ determined mouth structures. (He further holds that variations in auditory perceptions of phonetic pitch in speech correlate with air-density and thus with the altitude at which a language is used; this is an extreme version of the commonly-expressed folk-linguistic view that differences in prevailing atmospheric conditions generate accent differences, for instance the ‘adenoidal’ quality of the speech of once fog-bound Liverpool). As ever, detailed references on request. Another new topic area next time! 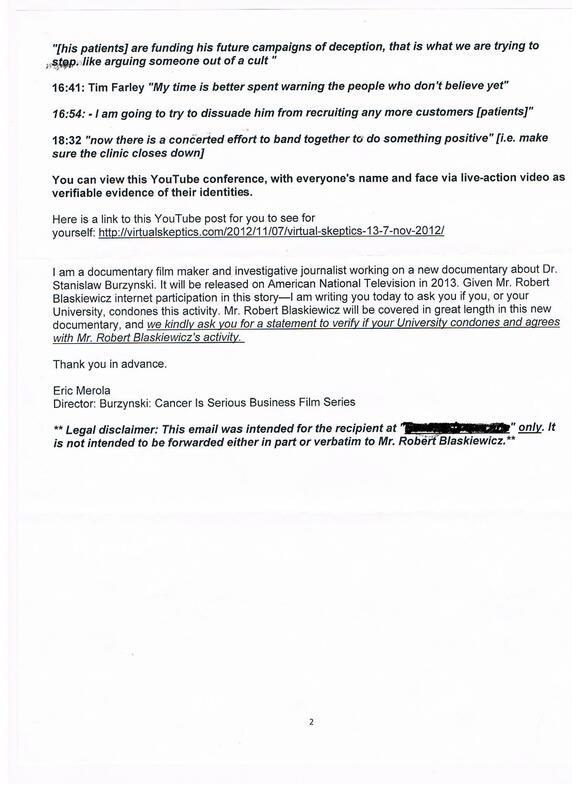 Burzynski Filmmaker Contacts My EMPLOYER?!?! Another Burzynski supporter (one at the same IP address as the Burzynski Patient Group) put up a website–albeit very briefly–which painted prominent skeptics…and somehow me… as pedophiles. (That’s my name in between those of two of my heroes, Simon Singh and Stephen Fry! Squee! Best. Defamation. Ever.) When it was discovered, the site was instantly taken down, but The 21st Floor has the goods. Well, people who seem to somehow think that they represent Burzynski are at it again; this time it is his propagandist Eric Merola (@BurzynskiMovie), the guy behind the straight-to-Internet stinker Burzynski. He is currently putting together a sequel (working title: Burzynski II: This Time It’s Peer-Reviewed). Let’s clarify a few things here, Eric. My “extracurricular” interest in Burzynski has nothing to do with my research and everything to do with my interest in science. 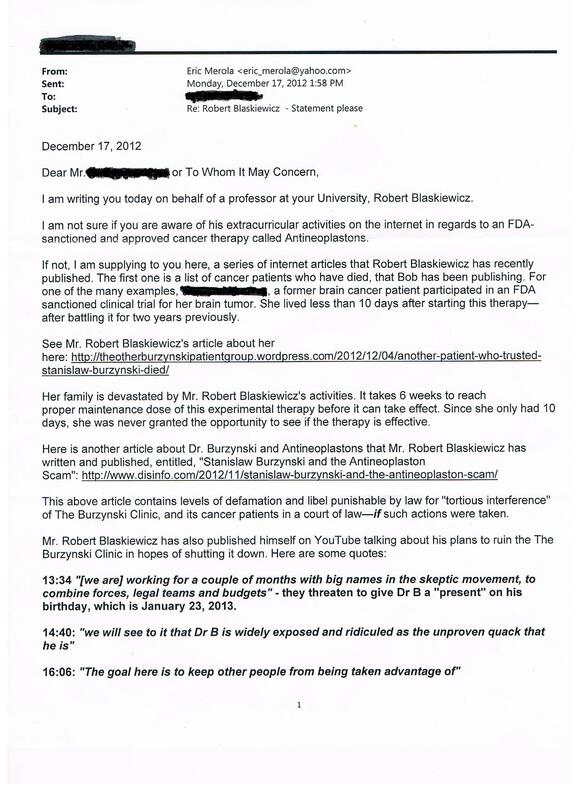 My letters, articles, and blog posts that discuss Burzynski do not appear on my CV. The things I do in my spare time are no business of my employer and they respect that. Your legal disclaimer is a joke; you are as competent a lawyer as you are a filmmaker. 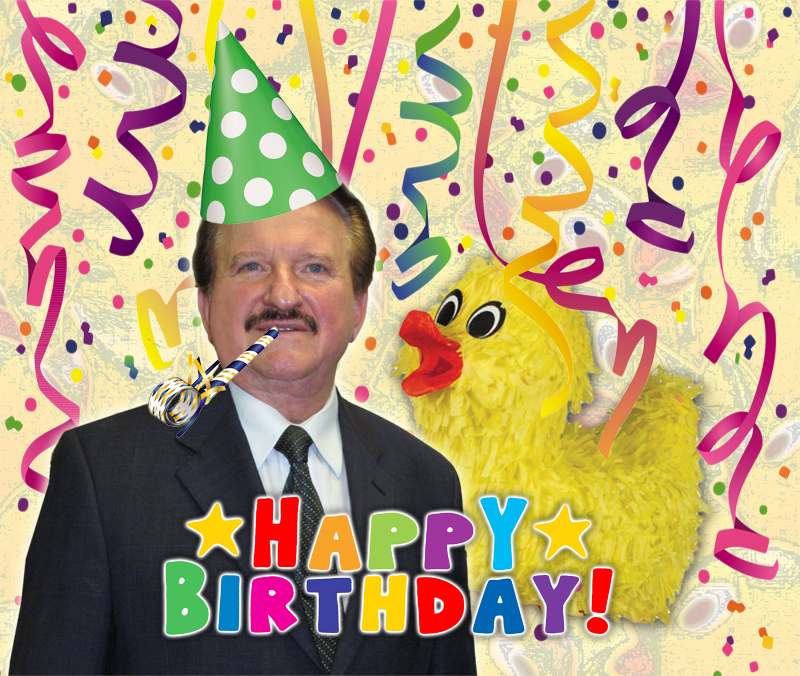 The “present” we are going to give Burzynski on his birthday is a challenge to the Clinic to match the funds raised by skeptics for St. Jude Children’s Research Hospital. The “something positive” you fear is what I have publicly called “Operation Cuddly Puppy,” a campaign designed to put reliable information about clinical trials and cancer treatments into the hands of cancer patients. I can see why a Burzynski supporter would be afraid of that. Regarding theOTHERburzynskipatientgroup.wordpress.com, I will be delighted for you to discuss my (and others’) work there in your movie. What we offer there is an honest look at the patients who have not made it, patients whose stories are just as important as the ones you believe Burzynski gave a happy ending. I’m not prying either; the patients and their families have already shared this information with the world. Also, it has about 30 total views (well, until today!). What you seem to be opposed to is open inquiry into what goes on at the clinic. In a way, I guess I’m not surprised that you went to my employer. I have gotten threats from other wackdoodles before who were going to “expose me to my employer.” This is more of the same. Eric, the interpretation of my actions that you put forward in your laughable letter are so far from the mark that I should warn you against replicating them in your movie–and now you have been notified of that. Furthermore, should you make any attempt to link my family or my employer to my online science advocacy, I will not hesitate to hire an actual lawyer and pursue you until you cry. The fact that you actively tried to hide it from me, to spread half-truths about me to my employer behind my back, is stunning evidence of your malicious motives. It’s like the type of thing trial lawyers dream of. If you are appalled by this behavior, I encourage skeptics to contribute to the St. Jude fundraiser. We will be donating everything raised to the hospital in Burzynski’s name and then challenge the Clinic to match those funds. If he doesn’t participate, we will still be able to say it’s probably the best thing ever done for cancer research in his name! You are currently browsing the Skeptical Humanities blog archives for January, 2013.